Sarah Caldwell, impresario, conductor, and brilliant stage director, made Boston an international operatic capital for three decades, winning laurels for her theatrical genius and arousing controversy for her freewheeling administrative style. ''Her whole life," her friend and Opera Company of Boston prima donna Beverly Sills once said, ''was one big improvisation, most of it inspired." Ms. Caldwell died Thursday night in Maine Medical Center in Portland. She was 82. 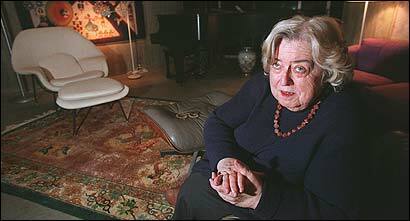 Her longtime assistant and former manager of the Opera Company, James Morgan, said yesterday that she died of heart failure. For many years, Ms. Caldwell had respiratory problems. In 1958, Ms. Caldwell founded her company with $5,000. She directed its first production, Offenbach's ''Voyage to the Moon," on Boston Common, a staging so successful Ms. Caldwell took it to the White House lawn; she followed up with Puccini's ''La Boheme" in a converted movie theater. Over the years, she presented a large, diverse, and challenging repertoire of more than 75 operas of every period and style, including many US premieres, and with a significant commitment to challenging 20th-century work. ''I learned an awful lot from Sarah and enjoyed the way she worked, even when she made mistakes," Shirley Verrett, Ms. Caldwell's leading soprano during the 1970s and '80s, once said. ''Even when I didn't think I was learning anything from her, I was. I would listen to her talk to the young people in the casts, and I would wonder why I had never thought of that." There was no single ''Caldwell style" of operatic production: She was interested in everything from Baroque theater practice to avant-garde methods using the latest advances from the labs at MIT, always applying her diverse interests in surprising and provocative ways. She embraced the whole spectrum of possibility -- original languages and English translation; major stars and emerging American singers; standard and variant performing editions; anything that was lively and pertinent. Ms. Caldwell's work was unified by a profound and comprehensive vision of how opera could be relevant and vital in our time, and defined by a splendid theatricality. Her adventurousness was often ahead of its time, and it took decades for other US companies to catch up to her daring, especially in repertoire. She also opened the door for subsequent generations of important female operatic directors. Sills, who sang in 17 operas for Ms. Caldwell, once said: ''Sarah did present challenges -- it was a challenge to be her friend, to be her colleague, her employee, but in the end it was worth it. . . . She could turn a piece you've done 100 times into something you felt you were experiencing for the first time." Ms. Caldwell was a large woman with a big, complex, imperious, and compelling personality that created fierce loyalties and aroused equally fierce opposition. Her strongest suit was staging. She became famous for her flamboyant theatrical effects: for Don Quixote being caught up by the blades of a stage-spanning windmill, for the casting of the golden statue of Perseus in ''Benvenuto Cellini," for the diorama of Rome spooling by in ''Don Pasquale," for the spectacular entry of the Trojan horse in ''Les Troyens." But she was also attentive to small details that linger in the memory -- the presence of Pinkerton's football among Madama Butterfly's treasures was infinitely touching. Placido Domingo said that hers was the most persuasive staging of Act III of ''La Boheme" he ever sang in. Ms. Caldwell could be a persuasive and stylish conductor in traditional repertoire, but her leading of demanding new works was a high-risk operation. One player said, ''She makes you want to play better than you ever played in your life, and then she makes it impossible." Ms. Caldwell was reluctant to delegate authority, and her administrative practices often summed up everything an impresario should avoid, establishing a negative example as powerful as the positive example of her artistic work. There were many unpaid bills, postponements, cancellations, and strange substitutions -- Ms. Caldwell once sold tickets for Verdi's spectacular and popular ''Aida" but offered Mozart's intimate and little-known ''La Finta Giardiniera" instead. But when all is said and done, Ms. Caldwell never said anything she didn't fervently wish to be true, and she did manage to keep the company going through one apparently insurmountable financial crisis after another until it was forced to cease operations in 1990. Many of her admirers were especially dismayed in 1983 when she entered upon a cultural exchange agreement with the Philippines at the urging of Imelda Marcos, the wife of dictator Ferdinand Marcos. Ms. Caldwell staged Mozart's ''The Magic Flute" in Manila, but shortly afterward, following protests, she withdrew from the arrangement. Ms. Caldwell was always ready to spend money she didn't have, but compared with other impresarios and the budgets of other opera companies, she operated on a shoestring. On her great nights, the sweep of her imagination and the power of her showmanship could never be represented by a line item in a budget. Urban legends circulated around Ms. Caldwell's personality, her ferocious intelligence, and her single-minded devotion to opera. Once, a major donor from Stop & Shop had to bundle up cash in grocery bags so the show could go on. She always vigorously denied that she padded around in carpet slippers and slept in the theater on piles of curtains, but she did fuel herself with hamburgers, and when the fuel ran out, she would doze off before snapping to alarmingly full attention as if she hadn't missed a thing. On opening nights and important public occasions, Ms. Caldwell could be a regal presence; a hairdresser had been in attendance. But when she was working, her personal appearance was the least of her concerns. She could drink just about anybody under the table, and she never hesitated to speak her mind. On the night of Ms. Caldwell's conducting debut at the Metropolitan Opera, a writer who had frequently written critically about her work went to her dressing room to get a quote. She pulled him aside to introduce her mother. ''She wants to meet you; she thinks you're wonderful. I haven't gotten around to that myself." Ms. Caldwell was born March 6, 1924, in Maryville, Mo. She grew up in Missouri and Arkansas and came to the New England Conservatory to study violin and viola in the mid-1940s. The turning point in her life came in 1946, when she won a fellowship to the Tanglewood Music Center and discovered opera and her first great mentor, the late Boris Goldovsky. Later, she came under the influence of the noted East German director Walter Felsenstein. In 1947, she staged Vaughan Williams's ''Riders to the Sea" at Tanglewood, earning the praise of Boston Symphony Orchestra music director Serge Koussevitzky, who appointed her to the music center's faculty the following year. In 1952, she began an eight-year tenure with the opera department at Boston University, where Igor Stravinsky admired her production of his opera ''The Rake's Progress" more than the US premiere production at the Met. By the mid-1970s, Ms. Caldwell had reached the apogee of her career with the Opera Company of Boston. Along with Boston Pops conductor Arthur Fiedler, she was probably the most famous artistic figure identified with the city. She ran a national touring company for one beleaguered but challenging season (Berg's ''Lulu" was in the repertoire) and for many years toured versions of her Boston productions throughout New England. She appeared on the cover of Time magazine in 1975, not long before she led a historic program of music by female composers at the New York Philharmonic sponsored by Ms. Magazine. In 1976, she became the first woman to conduct at the Metropolitan Opera. In this period, she began to guest-conduct major US orchestras, including the BSO, and staged operas for Houston and the New York City Opera and in Beijing. Boston remained Ms. Caldwell's home and the center of her operatic universe. ''The Opera Company was her baby," Morgan, her longtime assistant, said yesterday, ''and she believed you don't walk away from something you have made." But it was only in her own company, operating by her own rules, that Ms. Caldwell flourished. And she did all of it without a proper operatic venue. When her first major home, the Donnelly Theater, near Symphony Hall, was torn down, she entered an imaginatively daring itinerant period, staging opera in such diverse venues as the Shubert Theatre, MIT's Kresge Auditorium, the Cyclorama, and the Tufts University Field House before finding a more stable home in the Orpheum. In 1980, the Opera Company acquired the Opera House, which seemed a triumph at the time; at last she had found a home. But years of inadequate maintenance of the theater before Ms. Caldwell bought the property caught up with her, and she became embroiled in financial, tax, public safety, and other real estate problems that shadowed her the rest of her life. The last decade of the Opera Company represented a downward spiral -- financial and administrative chaos led to compromised artistic standards, which in turn led to further financial woes. Nevertheless, Ms. Caldwell was still capable of great work when the circumstances permitted. Her production of Janacek's ''The Makropulos Case" in 1986 ranked with her best, and Leonard Bernstein felt her 1989 staging of his ''Mass" was the finest the piece had received. The 1988 festival ''Making Music Together," in cooperation with composers, singers, and dancers from the Soviet Union, might have consolidated Ms. Caldwell's reputation permanently. There were many first-rate events during the three-week festival, and it helped bring international prominence to several significant creative figures, including Sofia Gubaidulina, Alfred Schnittke, and Giya Kancheli. But the adventure was seriously underfinanced and chaotically organized. Only the last-minute intervention of Secretary of State George Shultz made it possible for the festival to go on, and those who were forced to pay for it in order to avoid a diplomatic embarrassment never forgave or forgot. Ms. Caldwell struggled for years to dig her way out of the real estate mess and reestablish her company in Boston. Although she sacrificed most of her personal property and financial assets to the effort, she failed. The company ceased operations in 1991 and gave up control of the theater in 1996. Nonetheless, Ms. Caldwell experienced moments of triumph elsewhere. She became the principal guest conductor of the Ural Philharmonic, in Ekaterinburg, Russia, and gave the Russian premiere of Debussy's ''Pelleas et Melisande." She was a leader in an international library project to preserve musical manuscripts. In 1999, she joined the faculty of the University of Arkansas, where she directed innovative productions of Puccini's ''La Boheme" and Britten's ''The Turn of the Screw," which she staged in a bar. Her time in Arkansas was shadowed by deteriorating health. In 2003 she moved to Freeport, Maine, where she bought a house and Morgan looked after her. Ms. Caldwell came back to Boston in 2004 to receive an award from the New England Opera Club, and Mayor Thomas M. Menino proclaimed a ''Sarah Caldwell Day." In 2005, she attended a screening of Richard Leacock's film about her activities in Russia, ''A Musical Adventure in Siberia," at the Museum of Fine Arts. When the lights went up and she was discovered seated in the audience, there was an ovation. Ms. Caldwell was the recipient of 35 honorary degrees, and in 1997 she received the National Medal of the Arts from President Clinton. Praising the way she had brought ''difficult but beautiful operas to the stage," Clinton said, ''she's come a long way from Arkansas, and I'm very proud of her." Ms. Caldwell leaves no survivors . She will be cremated after a private ceremony in Maine, and there will be a public memorial service in Boston in the spring.